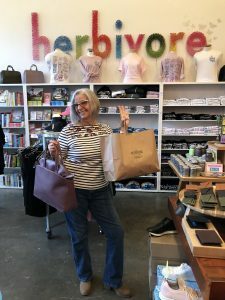 I visited the brick and mortar store on my recent Vegan Tour to Portland, Oregon. I did lots of shopping damage there, including a Matt and Nat mauve pocketbook, so I highly suggest you take a look! Make sure your payment options are handy! Talk about a one-stop-shop! Vegan Essentials has food & snacks, vitamins, home products, pet supplies, movies & books, even clothing. They won VegNews’ Veggie Award this year and I’m sure it’s because of the wide variety they offer. Now this one, whoo-eee cowboy, or cowgirl! This is one of my favorite shops on the whole internet! 100% leather free and sustainable boots and belts. Being in the southwest, owning a good pair of boots is sort of a prerequisite for any shoe rack. Living a 100% vegan and cruelty free lifestyle, well as you can imagine, it’s difficult to be a part of that “boot in-crowd.” But then I found Kat Mendenhall! Kat is a fellow Main Street Vegan Academy Master Vegan Lifestyle Coach and Educator I was fortunate enough to have her make a set of boots especially for me! 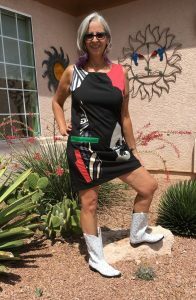 This Jersey Cowgirl loves to have a great reason to wear and show them off! If you’re ever in her home state of Texas, I suggest you stop by the storefront and see for yourself. Last but not least is more shoes! But Moo also has bags, wallets, belts, as well as other great apparel. I love their tank-top selection and graphic tees. The list of brand names they carry is quite impressive. So go forth and shop my vegan friends! If you have some other vegan shopping sites you frequent, I’d love to hear about them.